I became involved with the removal of Marmot Dam in November of 1969. It all started in the Whistle Stop Tavern about a quarter of a mile from our current sore location. Herb Forbes said, "Marmot Dam can be removed legally through a relicensing process with the Federal Energy Power Commission." I was excited and said, "Let's do it!". Freddy Gilbert grumbled from behind the bar, "You goddamnrights! Let's gitt'r done!." We started raising money and getting to work. It only took 38-years to get rid of the dam, and another ten to get to the report below. This article comes from our good friend Todd Alsbury, who is the District Fish Biologist for the North Willamette District, in Oregon, which contains the Sandy River watershed where The Fly Fishing Shop is located. CLACKAMAS, Ore. – Ten years ago a new era of salmon and steelhead recovery quite literally started out with a bang when Marmot Dam was removed from the Sandy River. More than a ton of high-grade explosives were detonated, taking off the face of the 47-foot high concrete dam. At the time, it was the largest dam breach ever attempted. Portland General Electric, owner of the dam, figured it would be more cost-effective to remove the structure than upgrade it to meet new federal relicensing standards. 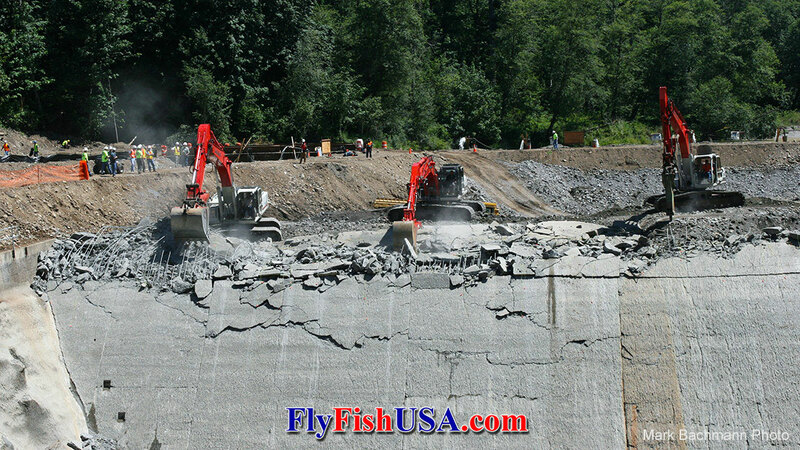 In July 2007, in a highly publicized event, PGE blew the concrete face off its dam on the Sandy River. For the next three months, large backhoes with pneumatic hammers pulverized, drilled, pulled apart and hauled off the remaining pieces of the dam. On Oct. 19, a rainstorm swept away the backfill that had accumulated behind the dam, making the Sandy totally free-flowing again, from its headwaters on Mt. Hood to its confluence with the Columbia River in Troutdale 56 miles away. Biologists, conservationists, anglers, and others hailed the removal of Marmot Dam as a victory for imperiled native runs of Chinook and Coho salmon and steelhead. The hope was that fish would benefit from better flows, better water quality and unrestricted access to prime spawning grounds in the uppermost reaches of the river. So has 10 years of a free-flowing Sandy River been good for fish? The answer is an unqualified ‘yes’, according to Todd Alsbury, ODFW district fish biologist for the Sandy, and one of the partners in the removal of Marmot Dam. Now, for the past three years, when other runs of salmon and steelhead around the region have been down, the Sandy has been seeing increasingly strong returns; in some cases, double what they were a decade ago before Marmot Dam was removed. “While not solely due to dam removal, returns of wild spring Chinook, winter steelhead, and coho have increased significantly as compared to their abundance before the dam was removed,” said Alsbury, who noted that in the 10 years since Marmot Dam was removed ODFW has observed the largest returns for all three species in the 40 years. For example, the number of wild spring Chinook increased from an average of 809 before dam removal to 2,086 afterwards. Similarly, Coho increased from 784 returning fish before dam removal to 1,959 afterward, and wild winter steelhead increased from 898 to 2,757. To really gauge how successful removal has been, though, it helps to look at how the fish were doing prior to removal of the dam. Wild spring Chinook were nearly extirpated in the 1950s and ’60s by dam operations, habitat losses, and other human impacts. During this period, fishery managers tried to rebuild the population with hatchery Chinook, which were intercepted in a trap at Marmot Dam and trucked to Sandy Fish Hatchery, where the next generation of fish was spawned and reared. However, fisheries management changed dramatically in 1998 when the fish were listed as threatened under the Endangered Species Act. This triggered discussions about ways to recover the fish, including by taking out Marmot Dam and reducing releases of hatchery fish so there would be fewer of them to compete with the ESA-listed wild fish. These discussions also led to one of the first integrated brood programs whereby wild spring Chinook were reared at the hatchery, and later cross-bred with hatchery Chinook to create a fish closely resembling the native fish, instead of looking outside the basin for replacement stock with different genetics. When Marmot Dam was removed, ODFW biologists lost a fish trap that gave them the ability to catch and separate wild fish. The fish needed to be separated so the wild ones could go on upstream to spawn while the hatchery fish were captured and taken to the hatchery to spawn. For the first two years after dam removal, ODFW staff netted brood stock out of the river using large seine nets pulled by swimmers in full wetsuits. Later on, biologists installed weirs, or portable traps, in the river for this purpose. To continue providing a recreational fishery, Alsbury and his staff developed an acclimation site to rear and release juvenile fish at a location that is suitable for returning adult fish. They now collect adult fish using temporary weirs near the release location to capture returning adults. Afterwards, the weir can be removed from the river. Mark Bachmann's perspective on the report above. I have not seen the data that Todd used to generate his numbers, but I personally believe that those numbers are logical, and believable according to my observations. It offers a compelling story of people who believe that they can influence their own destiny and the destiny of their community and culture. In ten years, wild winter steelhead increased from 898 to 2,757, which means that we now have three times as many, as before the dam was taken out. That is not the whole story, but it appears as a win, and it is nice to get a win once in a while. The first question that comes to my mind for all of us to ponder is why did it take so long. All the evidence was available in 1969. The Dam should have been gone in 1974, but society waffled. If we had taken the dam out then we might be having wild winter steelhead runs of over 10,000 fish by now. However, a triple increase in the last ten years is a figure that many fishery managers wish they had to talk about. The last three seasons have been hard on many steelhead runs. 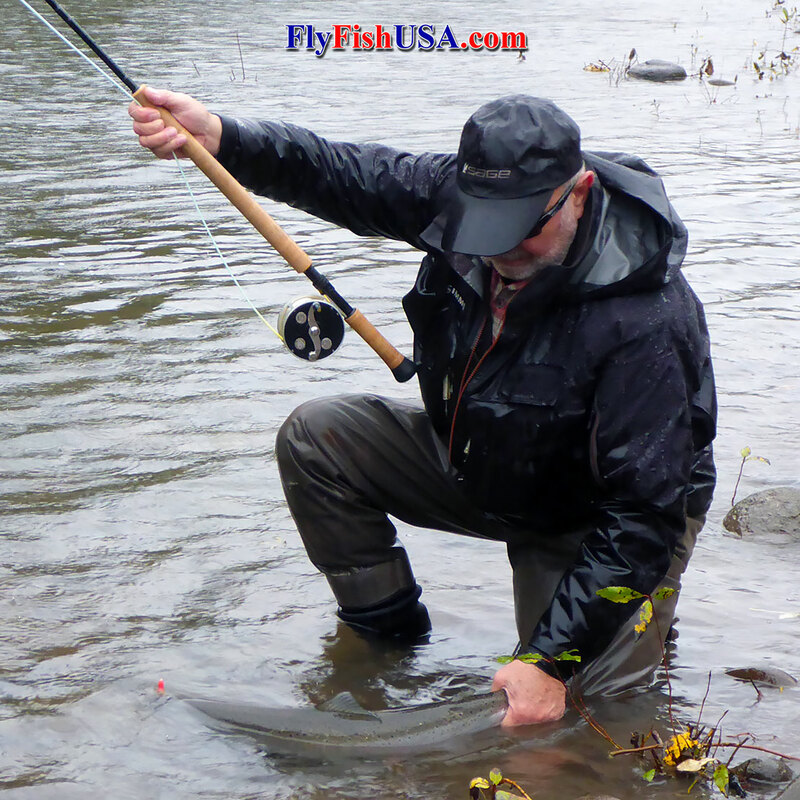 Sandy River steelhead are on the increase, whereas most other Columbia River tributaries are not. Our resident trout fishery is also expanding under current management as well. Our community has invested several million dollars into fishery habitat restoration projects over the last twenty years. Having been involved with the Sandy River for over fifty years has resulted in some wild mood swings with the ebb and flow of fish runs and human politics. It has been an exhilarating adventure. For the present time, it feels good to be winning. Landed this fish, a very bright wild winter steelhead, 11/15/17. My predictions for the 2017/2018 Winter Steelhead Season is that fish numbers will be up some over last winter. Water conditions will be a key factor in whether very many get caught. The first part of last winter's season was brutal with a choices between floods, ice storms and snow. The fish were there, but it took better than average skills to get them, when you could even get to the water. 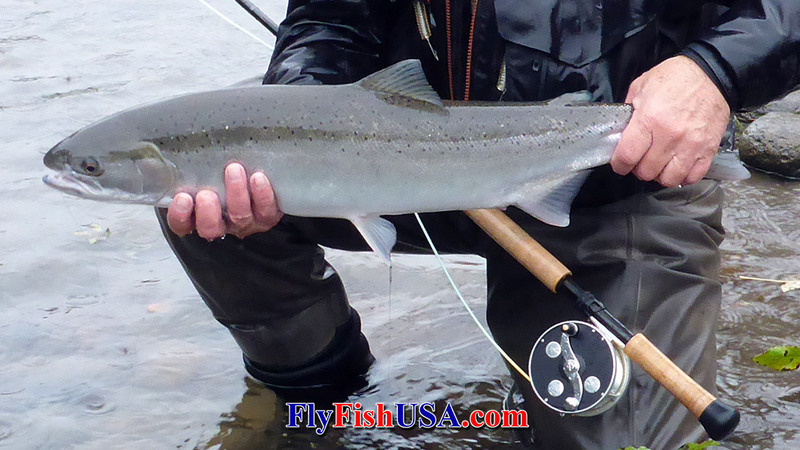 That is winter steelhead fishing, and some winters are just like that. Luck still favors the angler with the fly in the water. It will always be that way, and that is how it should be!